To make this fairy birthday party invitations you need to copy a nice fairy picture from the internet and print it out on sparkly clear vellum. Put white glitter glue on the wings of the fairy so the fairy shines. Below the fairy write something like "Anna's 8th Fairy Birthday Party" and inside the invite write all the party information. To make this birthday party invitations you need to buy fairy type wands (at the dollar store). Write the name of each guest on a small piece of pink paper. Use a hole punch and attach the small paper to the wand with ribbon. "Name" is invited to Anna's 8th Fairy Birthday Party. All you need is Fairy wings and Pixie dust to join this party. Please join us, there will be lots of Fairy Crafts and Party Games. Please come dressed in a outfit suitable for a Fairy birthday party. Your daughter should be dressed up as a fairy. She should have a fairy wand and fairy wings. Also, ask guests to dress up as fairies or transform them into fairies as they arrive to the party. Stick one or two stars on each child's face, cheek or hands - these are fairy marks. Also, give each kid a fairy dust bag, a fairy wand and fairy wings (these are your party favors). You have to try to decorate the fairy birthday party area like a flower paradise. Decorate the party area with lots of balloons with fairies on them and hang lots of green streamers to look like leaves. Try to put silk flowers and wreaths all over the party area. Or make tissue paper flowers in different shades of white, purple, pink and yellow and tape them to the ceiling. Cut out green leaves from green paper and tape them next to the flowers. Tape lots of butterflies around the flowers and leaves to look like a beautiful garden. Use a white table cover and decorate the table with butterflies. Use plates, cups, etc with fairy images on them. Have a huge vase with beautiful fresh flowers for centrepiece. Invite the girls to make magical fairy wand pens. Beforehand buy lots of silvery pencils and small white and pink feathers. At party time ask guests to glue feathers to the end of the pencil. When done each guest will have her own fairy wand pencils. Invite the kids to make fairy headbands. Beforehand buy lots of headbands and make lots of small tissue paper flowers in different shades of white, purple, pink and yellow. At party time invite the kids to glue the flowers onto a headband. Invite the kids to make fairy necklaces. You will need white, purple and pink beads and white glitter glue - fairy dust. At party time ask the girls to glue some "fairy dust" on the beads and string them. The girls will love to make this fairy necklaces. Fairy birthday party game similar to musical chairs. The fairies have to fly or jump from one leave to another. Cut out leave shapes out of green paper and have the girls walk on them while music is playing in the background. Stop the music, the person who is not standing on a leave is out of the game. The fairy touches one kid with her fairy wand and tells that kid to act as an animal or thing. The kid has to act like the animal or the thing, she can make noises. The other kids have to guess what she is. The kid who guesses right get to be the fairy and touch some one with her fairy wand and the game starts again. 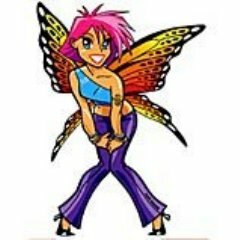 Print out fairy clipart pictures from the internet. Glue them on cardboard and cut them into a puzzle and put them in an envelope. Give each kid their own envelope and on the count of 3 let the kids compete in building their fairy puzzle. The first kid to finish gets a small price. One of the players have to be "it". "It" has to try to tag the other players. If you get tagged you have to freeze and stay still, until another fairy can unfreeze you with a little bit of pixie dust upon your head. Before the party print out some fairy pictures in different colours. Cut the pictures out and hide them around the party area. At party time assign each girl a colour to hunt for, and once they found them, they get a little bag of candy. Provide pictures of different fairies to the girls. Each girl has to pick a fairy she wants to draw a picture of, but she can only use one hand to draw with. The girl who draws the best pictures, wins a small price. Kids love piñatas, so why not have a fairy piñata. Fill the piñata with lots of candy and fairy stickers and other small items. Finish the party off with a fairy story. Have a fairy come to the party (a friend or teen). Have her read a fairy story and help out with games. Fairy Sandwiches: Fill bread sandwiches with honey or cream cheese and pineapple. Cut the sandwiches into flowers shapes using a flower shaped cookie cutter. Mini Sandwiches: Serve tiny sandwiches without crusts. Have a choice of peanut butter, cream cheese or jelly. Flower Meringue: Fairies like to sit on flowers so make flowers shaped meringues. Mix egg whites and sugar beaten until stiff, cooked on low temperature. Fill a flower cookie cutter with meringue, when baked add some chocolate icing. Fairy Cupcakes: Make cupcakes and frost them green, pink, purple and yellow. Buy little butterflies or fairies (from craft stores) that are on a stick and stick them in the cupcakes. Fairy Punch: Make a light blue punch with fruit and add star shaped ice cubes. Buy a cake shaped pan in the form of a fairy. Fill the outlines with decoration gel. Or make a chocolate sheet cake filled with butter cream. Put lots of fairies on top of the cake. Make the fairies out of sculpey clay. Buy little fabric purses (at craft stores) and add fairy buttons (from eBay) to the bags with matching tulle (under the button), so it looks like a flower. Fill the party bag with a small fairy , a Tinker Bell fridge magnet , a sparkly ring and necklace, a stamper and glitter pen. In addition the girls also get the fairy outfits, their fairy wand pencils and fairy necklaces. I hope our fairy birthday party ideas will help you plan a great party and I hope your little princess will enjoy her fairy birthday party.